It's a poignant home run for the final installment of Phillip's cute, sports-themed Hot Zone series (after Hot Stuff). Hottie John Roper, a high-maintenance outfielder, feels a cold downturn in his public and personal life after getting injured and losing the World Series for the New York Renegades. 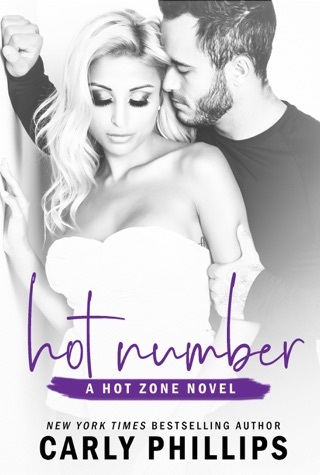 After meeting adorable Floridian Amy Stone at a friend's wedding, he later discovers she's his new handler at Hot Zone and Athletes Only, a sports public relations firm. Amy's wowed by John during a New Year's bash, spends the night on his sofa and attracts the paparazzi the next day. As she helps him reclaim his life (and navigate his difficult family), she decides their relationship must stay strictly professional. That love obstacle allows Phillips to wind up with a smart lesson: it's all about the game plan. This is the 4th book in the Hot Zone series but it can be read stand alone. In this book we finally get to see who John Roper, center fielder for the New York Renegades, and Micki Jordan's best friend will end up with. In Hot Item we met Amy Stone. She is Spencer Atkins niece. Amy and John seemed to be hitting it off good at Sophie and Riley's wedding until John's date intruded. Amy deciding she needed a big change in her life decides to move to New York and be a PR agent for the Hot Zone. When John doesn't tell his family that he can't be in the middle of every issue they have, Amy takes drastic measures and kidnaps John away to Brandon Vaughn's lodge in upstate New York without letting his family know where they are. I loved how Amy got rid of John's phone...priceless! As the two of them are at the lodge, that's when the fireworks finally explode. Amy is used to being the good girl and has to work hard to curb her wild tendencies. John tends to go with the flow and just have fun. Together they balance each other out very well. I just adored the things John would do with Amy. These two really meshed well together. Add in both of their crazy families....Amy's mom was once arrested for indecent exposure along with her aunt, while John's mom is a famous actress who is past her prime but still acts like she isn't, his sister who is trying to plan a small wedding which her mom keeps trying to change and then his brother who would rather just get money from John instead of growing up and being an adult. Overall this was a fun story that had me laughing out loud at times along with swooning at others. Great characters and a great story! Hot Property is another winner in the Hot Zone series. Since each of the Jordan sisters have each found their happily ever afters, it was time for another Hot Zone member to find happiness. We finally get John Roper's story and it was totally worth the wait. I loved that Spencer's niece Amy Stone came to work at Hot Zone. I loved meeting her in Hot Item and was happy we got to know more about her in Hot Property. The fact that Amy and Roper were thrown together from the moment Amy arrived at Hot Zone made my heart sing. I knew John Roper needed a strong woman in his life. Not only because he was a celebrity baseball player, but he needed someone to help him deal with is family. Amy has had years of practice dealing with difficult family members thanks to her mom and aunt, who tend to get into all sort of scrapes. They are one of the main reasons Amy wanted to move away to New York. I loved that while Amy could see how John needed to deal with his family, she was totally blind to dealing with her own family until John pointed it out to her. John and Amy had the absolute best chemistry. I seriously loved they actually were friends before they became lovers. I felt like it made their relationship stronger overall, not that there weren't some stumbling blocks on both sides. However when they were together, they pretty much burned up the sheets. I also loved they both had to learn to handle their families and fight to make their relationship work. Hot Property was a wonderful end to one of my favorite series ever from Carly Phillips. While I fully believe readers should read the entire series in order, I also feel strongly that with the Hot Zone series, each book reads well as a stand-alone story as well. The instant attraction dimmed a bit in this continuation of The Hot Zone series. Luckily they find their way back to each other later in the book and the excitement builds again. Fun characters with lots of family drama, work overload and funny antics of the cast around them keep us entertained and wanting more. Professional baseball player John Roper was at the peak of his career a few short months ago, and then he hit a slump … and it went from bad to worse. He’s trying to rebound in the off season to come back fighting hard when the season starts, but his family is driving him crazy. He can’t take care of his body’s needs to heal and train if he can’t get a minute to himself. Amy Stone has taken a job with her Uncle Spencer’s company and is now living in NY and working at The Hot Zone. She and John have a little chemistry explosion the second they lay eyes on each other and when they end up working together, they have to recommit to getting to know each other and forging a working relationship. Can she manage to wrangle his family for him and get him concentrating on himself and his comeback before it’s too late?